Bacon and Eggs... To Go! I got this recipe from Pinterest. My cray cray life needs more protein. More protein = more energy, right? I made these like two weeks ago, but whatever. I told you...cray. So I made this, because eggs have protein, and D really likes bacon. Well everyone likes bacon, but especially D.
A lot of the recipes on Pinterest say to just crack the eggs in the muffin tins. But I wanted them to be scrambled eggs, so that they were easier to eat in the car (classy, I know). But this might be one of the easiest make ahead breakfast foods. I prepared it before I got in the shower, then took them out of the oven when I was done with my makeup. BAM, done. 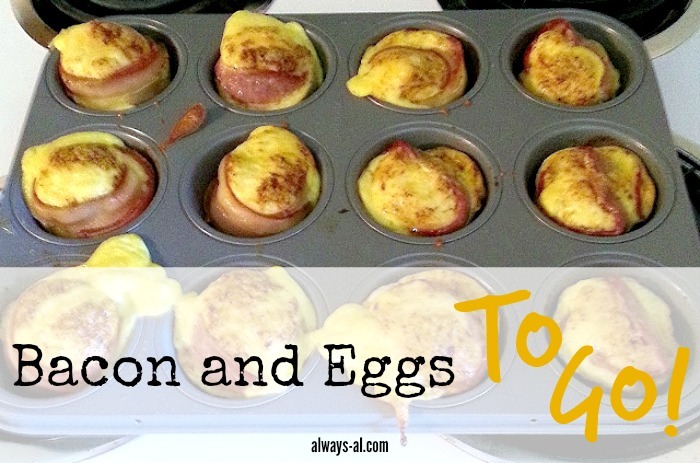 All you do is circle each cup of the muffin tin with a piece of bacon. My tin has 12 cups, so I scrambled up a dozen eggs, added in a little salt, pepper and a good helping of chili powder for flava, and just poured it in. As you can see, my eyeballing measurements might need some work. They ended up tasting alright. The bacon wasn't crispy, which both D and I prefer. But they served the purpose they were meant to serve. Each one is like a little mini breakfast. Throw two in a tupperware and you have lunch. So easy, which I think is the most important part of good recipes.